If you know you’re not in a condition to drive, it’s best to, you know, stop driving. Of course, this doesn’t mean you should just stop in the middle of a road and let your Hyundai just sort of roam free like this woman did. That’s actually probably worse than driving impaired a few seconds longer to get somewhere safe. Just a thought. That’s pretty terrifying, and an objectively terrible decision on behalf of 22 year-old Jasmine Lacey, who did this last Tuesday on Harbor Blvd. in Rowland Heights, CA. I think the most amazing thing is the bizarrely casual quality she has as she exits the car, adjusts her coat, and proceeds to blithely walk down the median as her Sonata careens over the median, door ajar, and into oncoming traffic. Thankfully, no major accidents seem to have happened before the car made it across to the other side’s shoulder before stopping. 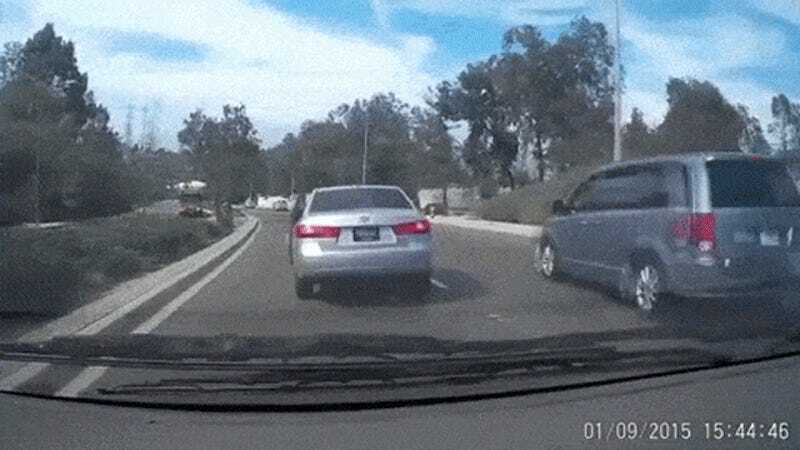 Based on the footage from the car behind hers — which appears to have a driver with good reflexes and well-sorted brakes — she was driving pretty erratically before the incident. ... due to insufficient evidence to support a criminal complaint, according to Los Angeles County booking records. What the hell? Does this video not count as evidence? Is it not illegal to just exit and abandon a moving car on a public road? Lacey was taken to a hospital for reasons not directly related to the incident, so hopefully she’ll get the help she seems to need, and maybe a refresher in some basic rules of driving.